SI NFL expert Peter King was apparently up watching with us as Texas and Boston College played a 25-inning marathon Saturday night. He devoted an entire page of his weekly Monday Morning Quarterback column to Texas pitcher [tag]Austin Wood[/tag], heaping high praise on him and providing some really good quotes from Austin and Coach [tag]Augie Garrido[/tag]. When he walked off the field, just after midnight, everyone in the stadium rose and cheered. 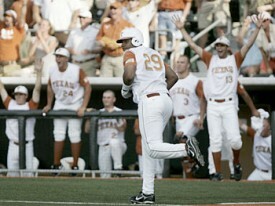 The Longhorn bench emptied and met him with cheers and high-fives and hugs in front of the dugout. The BC dugout cheered. Austin Dicharry, the reliever, got two quick outs to send the game to the 21st. and Texas won it in the 25th, finally, on a Travis Tucker RBI single to right — after Tucker had gone one-for-11 up to that point. “Did you sleep OK?” I asked. And that is why we love sports. Austin Woods was dominant and durable in relief. The game lasted over 7 hours and ended after 1 am, but in the end the Longhorns came out on top of [tag]Boston College[/tag] and have moved to 2-0 in their CWS Regional bracket. Next up for Texas will be a game tomorrow at 6pm against the winner of the BC/Army match-up. Texas will have two chances to win one game to advance on to the Super Regionals next weekend. The Texas baseball team took a huge step towards a Big 12 title over the weekend by sweeping [tag]Baylor[/tag] in a three game home split series. That is now two sweeps of top conference foes in the last three series, the first came two weekends ago against [tag]Oklahoma[/tag]. The Longhorns needed a big weekend following a 0-2-1 series at home against [tag]Kansas State[/tag]. Texas has relied on pitching for much of the season but in the first two games the Longhorn offense exploded for double digit run totals thanks in large part to horrible defense by Baylor. Augie Garrido’s group hosted game one on Friday in Austin in a matchup between [tag]Chance Ruffin[/tag] and Kendal Volz that aired on ESPNU. Volz, the closer for last year’s USA national team and a likely first round pick, struggled early with his control and Longhorn hitters took advantage. [tag]Kevin Lusson[/tag], playing at DH and on fire, came through with an RBI in the first inning. UT added another run on a Volz wild pitch to take a 2-0 lead after one. The Longhorns added two more in the second, and following a Baylor run in the top of the third, added a fifth run in the third. Up 5-1 with Ruffin cruising Texas looked to put the game away early but Baylor added two in the top of the fifth and one more in the top of the sixth to cut the lead to 5-4. The Bears had the momentum, and Volz had settled down by getting ahead of Texas hitters, but the Baylor defense couldn’t stay out of their own way. They committed seven total errors on the night, one of which was on Volz himself. Texas scratched across four runs in the seventh and three runs in the eight to stretch the lead to 12-4 with closer [tag]Austin Wood[/tag] on the mound. Wood pitched three total innings, a decision that was puzzling with an eight run lead and two more games left in the weekend, allowing no runs. On Saturday the series moved to Waco. And it wasn’t a good day to be a pitcher. The two teams, both known for solid pitching, allowed a total 30 runs on 25 hits in the nine inning slug fest. 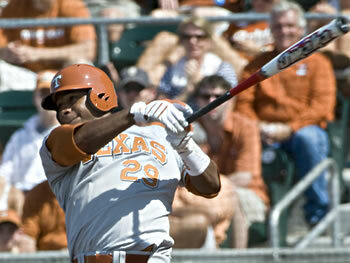 It was the Longhorns once again that jumped on the Bears early with 10 runs in the first three innings. The offense was led by the home runs of [tag]Travis Tucker[/tag], [tag]Brandon Belt[/tag], and [tag]Cameron Rupp[/tag]. [tag]Connor Rowe[/tag] had his second strong game in a row collecting four hits in six at bats on Saturday alone. [tag]Cole Green[/tag] got the start for Texas and he gave the Horns a very solid seven innings of work. The sophomore gave up five runs, only two were earned, with 10 strikeouts. Texas stretched the lead all the way to 19-5 going into the ninth inning where Baylor made a late push to bring the score closer but it was too little too late. 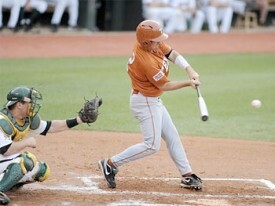 Texas needed the sweep on Sunday in Baylor to put an exclamation point on the series and that is exactly what they did. Texas teams in the past few years have lacked that killer instinct, hopefully a performance like this weekend’s propels them into the postseason. [tag]Taylor Jungmann[/tag] got a rare weekend start in place of [tag]Brandon Workman[/tag] as he battles a few injuries and bad outings. And the freshman made a case to make the move permanent with a dominating performance. The former Georgetown star struck out 10 batters in six innings allowing only one run on three hits. Jungmann has the most upside of any pitcher on Texas’ staff and it was a great sign to see him step up in a big moment. Baylor got a great pitching performance of their own from Willie Kempf, but the Longhorn bats managed to a few more runs than the Bears could match. Texas’ offense was led by the three hits of leadoff hitter [tag]Michael Torres[/tag] and the huge two run RBI homerun by Rupp, his second of the series. Wood came in to close out his second game in three days to seal up the series. The sweep puts Texas to the top of the standings along with A&M and Kansas State. The Longhorns will face A&M at home May 8th-10th in what could become a series to decide the regular season championship and the number one seed in the conference tournament. With a series win against the Aggies the Longhorns would essentially become a lock to be one of the top 8 seeds in the national tournament. That would mean Texas wouldn’t have to play outside of Austin until the College World Series if they were able to advance that far. The Texas Longhorn baseball team got a much needed series win against [tag]Texas Tech[/tag] over the weekend. Tech managed to sandwich a 4-2 win on Saturday in between Longhorn wins on Friday and Sunday. The series win couldn’t have come at a better time. The Longhorns sit at 4-5 in the Big 12 with a brutal schedule, starting with [tag]Oklahoma State[/tag] next weekend. Texas has yet to win a conference game on the road and they’re sure to face Oklahoma State’s Andrew Oliver in the series opener. [tag]Chance Ruffin[/tag] got the win on Friday after giving up 4 in 6.2 innings of work. Ruffin moved to 4-2 on the season on a night he didn’t have his best stuff, but was able to command the strike zone. 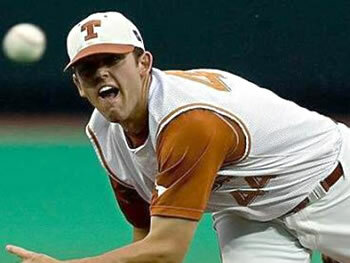 The Longhorn ace threw 98 pitches on the night and 71 counted as strikes. Closer [tag] ustin Wood[/tag] came in with a one run lead in the top of the seventh to shut the door. Texas only scored in two innings, but they made both of them count. The Longhorns scored five in the bottom of the third after Tech took the lead in the top half of the inning by scoring two. Texas also managed four runs in the bottom of the seventh to put the game away. Both the Longhorns and Red Raiders recorded 11 hits, but it was the five Tech errors that were the difference. The Longhorn bats went quiet in the second game. Texas has struggled at the plate, especially with runners in scoring position, all season and it continues to be what is holding this team back. Texas got off to a good start, scoring two runs in the first, but could manage nothing after that. [tag]Brandon Workman[/tag] had a tough outing and fell to 3-2. He gave up four runs in just four innings of work. [tag]Keith Shinaberry[/tag] and [tag]Taylor Jungmann[/tag] combined to shut out Red Raiders for the rest of the game. Texas never got a rally going however and Tech took the victory. The Sunday game was about as much of a must win as a top 15 ranked team can have this early in conference play. After propelling the first in the polls after a series win over [tag]Stanford[/tag], which in hindsight isn’t that impressive because the Cardinal are falling apart, Texas has struggled to say the least. And with the schedule getting much tougher coming up Texas couldn’t lose another series to a bottom tier conference foe. In the first real pressure situation of the year the Longhorns came through. Texas’ bats woke up by scoring in the first five innings. [tag]Cole Green[/tag] only went 4.2 innings so he didn’t get the win, but he was superb only giving up one run. [tag]Austin Wood[/tag] finished the second game of the series. The top of the lineup played as well as they had all season, but 1-9 this team is still struggling. The move to get [tag]Michael Torres[/tag] to third base and Brandon Loy to shortstop appears to be sticking. It really comes down to Loy’s bat because there is no question the defense will benefit from having him there. If Loy can get on base [tag]Augie Garrido[/tag] can keep him there, but if he can’t Texas may not be able to afford having any more holes in the lineup. This next weekend is very important for Texas. The last time this team was on the road they got swept by Kansas. The Jayhawks aren’t as bad as some thought, but the Cowboys are better. Texas already faced one of the aces in the conference when they took on Kyle Gibson and Missouri. The Longhorns were shut down that game and Oliver has that kind of talent. If Texas can win this series it will make up for the Kansas sweep because no team is running away with the conference lead, but if OSU takes two or all three of the games the Longhorns will have a huge hill to climb to get to the top of the conference. The Texas Longhorns dropped their first game of the season over the weekend, but managed to take the series in Palo Alto over [tag]Stanford[/tag] two games to one. The series win moved Texas to No. 1 in the new Baseball America poll. Right now three of the top five teams in the nation come from the Big 12 South and five of the top 12 teams come from the state of Texas. Pitching continues to be the anchor for this year’s team. The Longhorns have five legitimate weekend starters with only three slots open. Through 13 games Texas sits at 12-1 with a team ERA of 1.35. Each starter is capable of going seven innings plus, and with closer Austin Wood manning the back end of tight games the Texas bullpen has been untested thus far. [tag]Chance Ruffin[/tag] is the ace and will get Friday starts, it looks like [tag]Brandon Workman[/tag] and [tag]Cole Green[/tag] will get the Saturday and Sunday nods with [tag]Taylor Jungmann[/tag] starting the mid-week games and playing the role of long reliever on the weekend. Jungmann would be the Friday starter on the majority of college baseball teams. Texas is also receiving great play from their defense. Errors were the Achilles’ heel of last year’s ball club, and so far the work the team put into the offseason has paid off in spades. With the pitching staff on such a role it is imperative opponents aren’t given free base runners because of poor plays in the field. Outside of [tag]David Hernandez[/tag] who has seven errors, no one on Texas’ team has more than one. Texas is fielding .978 as a team. The weak link so far has been at the plate. Texas is only hitting .296 with five homeruns through 13 games. Texas is going old school with their approach at the plate. The Longhorns will look to manufacture runs throughout the season because the lineup just doesn’t have anybody who is going to strike fear in opponent’s hearts. Hernandez has struggled in the field of late, but is leading the team in hitting at .395. Texas has only four other batters hitting over .300 and no UT batters have double digit RBIs. Luckily it is early in the year and the pitching staff has not yet needed much run support. When Texas was winning championships it was behind stellar starting pitcher, shutdown bullpen work, good play in the field, and timely hitting. The Longhorns have never been confused with the mash brothers with Augie Garrido at the helm. Texas faces [tag]Baylor[/tag] in an out of conference matchup on Wednesday March 11th before hosting [tag]Missouri[/tag] and top pitching prospect Kyle Gibson to start the Big 12 season this coming up weekend.